Roy is involved in a diverse farming operation in the Imperial Valley (southeast corner of California) of approximately 3,000 acres. Crops grown include wheat, lettuce, cabbage, dry onions, sugar beets, sugar cane, alfalfa seed, alfalfa hay, sudan grass, melons, and tomatoes. While wheat is not a major source of income in their farming operation, it is a very important crop. In terms of acreage, wheat is the largest. Wheat is one of his primary growing responsibilities in our operation. He has been a member of the California Wheat Commission since 1998. Roy is past chairman of U.S. Wheat Associates. Larry Hunn is a third- generation farmer managing a diversified operation in northern California’s Sacramento River Delta. Larry farms with his brother Peter and their cousin John Merwin. In addition to wheat, they grow tomatoes, cucumbers, apples, corn, safflower, alfalfa for hay and landscaping ground cover crops. Their wheat is hard red winter planted in October and November that moves to export and local milling markets. 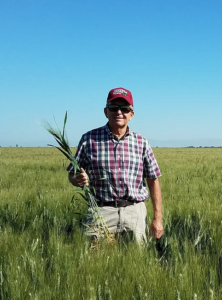 As an agricultural leader, Larry has been active in the California Farm Bureau and serves on the board of the California Association of Wheat Growers. He is past chairman of the California Wheat Commission and spent several years representing his state on the U.S. Wheat Associates Board of Directors.